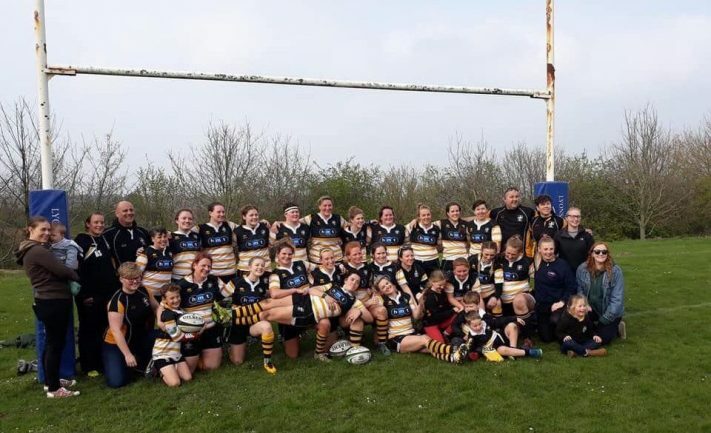 Portsmouth Valkyries travelled to Warminster looking to cap their unbeaten league winning season in style with a win in the play-off final against Bristol based St Mary’s OB Ladies to send them up into National Championship 2SW. From the kick off it became clear that this was not going to be a routine win, St Mary’s were also unbeaten in their league and ran the ball all over the park forcing Portsmouth into a lot of early tackling. For ten minutes the Valkyries weathered the storm before the referee gave a kickable penalty to St Mary’s for not releasing the tackled player, the penalty sailed through the posts for a 3-0 lead. From the kick off Portsmouth stormed forward and were now getting significant possession. Forwards Jordan Wilshire and Sophy Roseaman took the ball on, making ground and setting up attacks for the backs. Charlie Morgan, as usual, feeding Izzy Rawlinson good ball who in turn fed centres Bronwyn Jacobs and Chloe Stopard. Just before the half hour it was Jacobs who broke the defensive line and, being tackled by two SMOBL defenders, off-loaded to Stopard whose quick pass to left wing Laura Ineson gave her the space she needed to glide down the wing and score left of the uprights, St Mary’s 3 Valkyries 5. St Mary’s came back at Portsmouth and five minutes later the Valkyries were given offside in front of the posts and once again the kick went over leaving the half time score St Mary’s 6 Valkyries 5. The second half started much like the first with Portsmouth having to do a lot of defending, Nikki Buckingham at full back, Natasha Davison and Laura Millington all putting in big tackles. Kim Lewis took a knock on the knee and was replaced on the flank by Charlie Morgan, Rachel Kidner came on at scrum half. Portsmouth had the majority of the ball now and repeatedly tried to break down the St Mary’s defence, but were repeatedly penalised for not releasing the ball in the tackle. Coach Mark Witcher made changes in the forwards who were all working incredibly hard. Sandy Newsham and Fred French had given their all as had Wilshire bringing Leah Lind and Lucia Crotti on. With fifteen minutes left the Valkyries hammered at the door and eventually St Mary’s defence creaked, they were penalised in front of the posts but before a calm head could call for a kick at goal the tap penalty was taken. Three times Pompey got close through Roseaman and Rawlinson, one more phase and Kidner popped the ball to Natasha Davison who bulldozed over the line, the cheers were short lived as the referee decided she had dropped the ball and not grounded it. With seven minutes left St Mary’s cleared in to touch from the scrum but the Valkyries won back possession and quickly moved the ball infield. Stopard was tackled and the referee blew for a Portsmouth penalty, 20m out in front of the posts, much yelling of “posts!” from the travelling supporters and Stopard lined up the kick. You could’ve heard a pin drop until the ball was slotted through the posts and the Pompey supporters went wild. From the kick off the Valkyries charged up field keeping the ball tight and running the clock down. 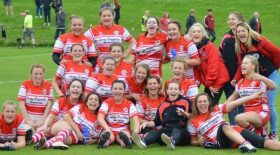 As the clock went red St Mary’s indiscipline gifted another penalty, Stopard once again coolly put the ball through the uprights, the final whistle sounded and a famous victory was completed.